I recently returned from a ten-day trip to Peru. It was an amazing experience, one that challenged me in new ways and exposed me to a new part of the world I had yet to explore, South America, with two close friends. As you can probably imagine, one of the highlights of our trip was the hiking. Pressed for time (we are all working gals with limited vacation days!) we hiked the one-day Inca Trail to Machu Picchu (8 miles) and the following day hiked Wanyapicchu, a steep mountain right next to Machu Picchu. While I do enjoy hiking, I certainly cannot call myself a pro, and didn’t quite know what to expect from these two hikes. I was nervous and unsure, but excited to see where the trails would take us. It’s easy to think that the summit of a hike, or a mountain, is the moment that makes it all worth it. As you stand triumphantly over the ground you have just conquered, taking in an exceptional view of the world below, there is an incredible rush of satisfaction and accomplishment. I certainly felt that at the top. 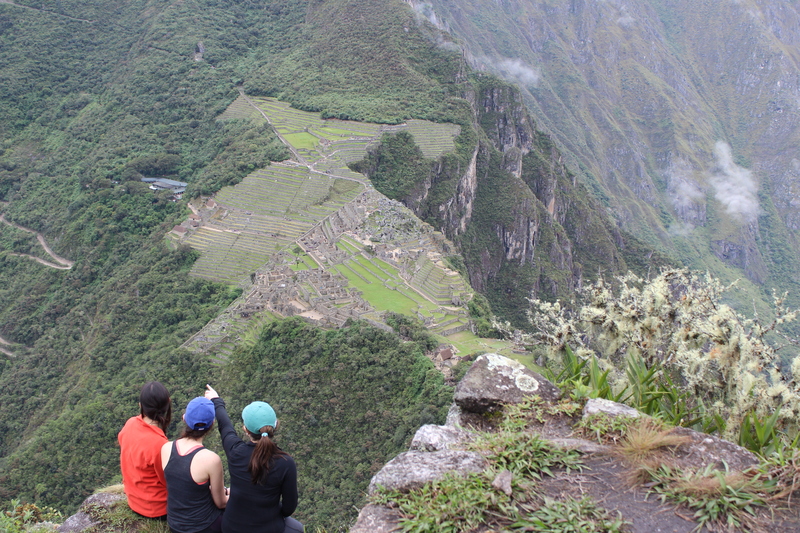 But in Peru, I realized that the journey up the mountain was more transformative than simply being at the top. It’s navigating the unsteady rocks, pushing through mental and physical exhaustion, and encouraging your comrades during the hike that define you and push you past your limits. It’s about the shaky feeling in your legs you get as you descend and the people you meet along the way who you exchange stories with. Those are the moments that define you, that guide you moving forward. There are many things that may stop you along your way. For us, the altitude made it hard for us to breathe, it was raining and the rocks were slippery. There is often a fear of getting hurt, or a fear of failure. I realized that appreciating the challenges made the successes even more rewarding. The easy way is never quite as fun. Hiking the Inca Trail and Wanyapicchu gave me perspective on my work both as an entrepreneur and with entrepreneurs. Individuals (myself included) may see the rocky, slippery, and sometimes flat-out dangerous path up as simply obstacles to overcome in order to accomplish their goal of seeing the view. But aren’t the challenges the fun part? Entrepreneurship not just about building a product or service that allows you to sit back, drink a pisco sour, and enjoy the view; it’s about the climb. It’s about the times when you feel like you just can’t continue, you need to stop and catch your breath, or when you feel stronger than ever and are able to encourage your team members to power through. It’s about the moments when your legs are shaky and you aren’t sure that your next step will be a successful one. And of course it’s about those moments when you ultimately summit, when you get to look down below at the world beneath you and see all that you have accomplished. It’s the culmination of the hike and the summit that make life interesting, and work as an entrepreneur exciting. If you aren’t interested in the climb as an entrepreneur, you’re in the wrong field. I don’t want to live in a world where I am always on top of the mountains. I want to push myself to be constantly climbing, catching my breath, and figuring out which rock to step on next. As I settle back into my NYC life, I strive to keep these lessons learned in mind, reminding myself that the challenges are often the most rewarding part of an endeavor.